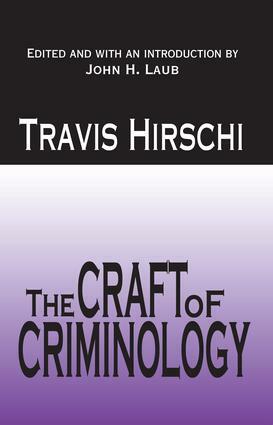 Travis Hirschi is one of the most cited criminologists of the twentieth century. His work has provoked controversy and heated debates about the causes of crime, proper research methods, and the most effective policies to prevent and control crime. Known as a spokesperson for social control theory, Hirschi always ties his ideas to the mode of investigation and the mode of investigation to substantive concerns. Theoretical contributions and research methodology have been twin driving forces throughout his career. This book contains representative selections of Hirshi's work over many years. It is remarkable how little is known about Hirschi's life and career. John H. Laub's introduction combines a discerning account of Hirschi's life and work, accompanied by an interview with the author. Laub's volume covers various topics: methodological issues; principles of casual analysis; criteria of causality; longitudinal research on crime; rules and the study of deviant behavior; correlations between crime and delinquency; control theory of delinquency; intelligence, causes, and prevention of delinquency; family structure and crime; theory of crime; crime and criminality; deviance; white collar crime; and juvenile justice systems. Now available in paperback, this is an invaluable text for courses in criminology, as well as a valuable addition to professional libraries.